Possibly the most profound statement that succinctly describes environmental responsibility is the phrase “pack it in, pack it out.” This message appears on campground signs throughout the country asking visitors to eliminate any trace of their presence as they leave. 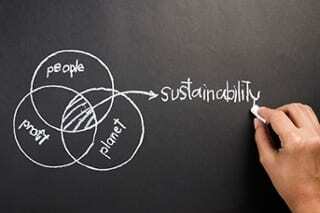 Sustainability may be defined with a similar message, but on a more global scale. We have a responsibility to preserve and protect vital resources so they may be enjoyed by future generations. But, unless the damaging activity of humanity reverses, this mission could become impossible. In a company, university, church or social club, a culture of sustainability can start with just one person or small group. These individuals are committed to sustainable solutions and committed to programs that inspire others. There are five steps to creating a culture committed to sustainability within a company. The leader of an organization that is committed to developing a sustainable culture must set the example. Concepts can start within the ranks, but full acceptance involves complete endorsement from the very top. Vision and Mission Statements should include phrasing that includes “with fullest commitment to Sustainable Practices” and action plans that point the organization toward measurable improvements. Each individual in the organization, top to bottom, must be made fully aware of the ecological benefits and rationale of sustainability. In addition, businesses that are eco-friendly have benefited from the positive image created by promoting and executing a culture of sustainability. Some companies today grade their supply chain member on their commitment to eco-friendliness in their products and practices and award business accordingly. Sustainability is a disciple not a function. An entire department may not be needed to execute an overall internal plan. One individual with a high level of commitment and excellent communication skills should be appointed to dedicate a portion of their time to leading, developing and measuring sustainable practices throughout the organization. Every department in an organization should create their own specific sustainability protocols. Purchasing or procurement, for example, should set goals that a specific percentage of material from the supply chain should be from recycled components. The same group might insist that suppliers attain a measurable level of sustainability within their own organization and set up quarterly reviews to monitor. Maintenance and facilities managers can immediately adopt practices that will have a quick and meaningful impact on the environment. Petroleum-based paints with high-VOC (Volatile Organic Compounds), harsh chemical cleaning supplies and fertilizers, and wasteful water fixtures should be replaced immediately with more ecologically positive products. This initiative or culture should easily reach to your vendors, contractors as well as customers. When creating a Business Plan, specific and achievable goals are already set each year for sales, expenses and profit. Another category, Sustainability, can also have a set of company-wide objectives that are deemed achievable and may be improved upon from year to year. With achievable sustainability goals worked into your business plan, your organization will experience growth, survival and a level of industry expertise. Making sustainability an unconscious and natural part of doing business also requires that each process be made simple. Where recycling is appropriate, a sufficient number of recycle containers should be scattered throughout the building. Lights and electrical equipment that can be shut off when not in use can be managed by timers or turned off manually. Paper should not be wasted and water usage reduced with water-saving plumbing fixtures. If the perceived waste item cannot be recycled, develop a way to reuse. Sustainability does not stop with tossing a foam coffee cup into a recycle bin. As people become knowledgeable of sustainable practices and more eco-friendly products are developed, the sustainability may occur more naturally. How do you use your job to create an environment around you with an established culture of sustainability? Share your techniques in the comments below!